Remember these things? Fruity syrup to splash all over your dessert (where Ice Cream would have been the most obvious choice) that came in a range of flavours – I am sure you can still get the Strawberry one. Anyway – 3 paper labels from these things plus £1 got you a space calender that would tell you what day a date fell on right through until ‘2001 ad’! 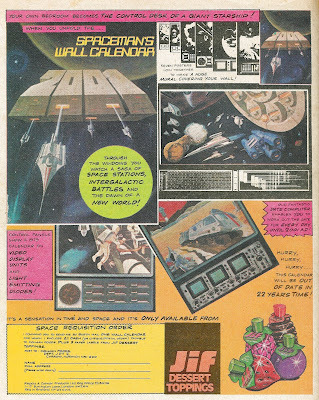 Good job too – advertising a 1979 calender in the midst of the summer holidays isn’t the brightest promotion idea ever. Taken from 2000ad & Starlord prog 126, 18th of August 1979.